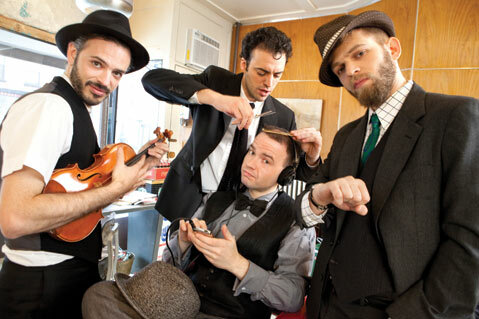 BARBERSHOP STRING QUARTET: The members of Brooklyn Rider — (from left) Johnny Gandelsman, Colin Jacobsen, Nicholas Cords, and Eric Jacobsen — get spruced up before they travel west to the Music Academy. Brooklyn Rider isn’t the first string quartet named after a New York City borough. But it is definitely the hippest. The ensemble, which will visit the Music Academy of the West next week, from July 3-5, isn’t easy to define. But according to violinist Johnny Gandelsman, that’s by design. It’s sometimes called a new music group, and the quartet does give a lot of premieres — more than 20 last year alone. But the players are also masters of the basic repertory. Their recital at Hahn Hall on Wednesday night, July 3, features works by two contemporary composers (including a member of the quartet, Colin Jacobsen), along with masterpieces by Mozart and Bartók. Part of the tradition Gandelsman is referring to is the link between folk music and classical compositions. “Bartók was one of the first ethnomusicologists,” he noted. “He traveled all around his land, as well as North Africa. He was really affected by the music he heard around him, and he incorporated it into his own unique language. Indeed, all of the quartet’s members have played in Yo-Yo Ma’s Silk Road Ensemble at one time or another. The name Brooklyn Rider comes from two sources: the Blue Rider artistic collective, which was active in Germany in the early 20th century, and the part of New York City all four musicians call home. Critics, when they’re not praising the players’ adventuresome programming or outstanding technique, tend to use the word “approachable” in describing the group. Stuffiness is definitely not part of its repertoire. “We have a good time, and we want audiences to have a good time,” Gandelsman said. “We do talk from the stage a little bit, about the pieces and our thoughts behind the program. It’s important to us to make the performance memorable. Besides performing, the musicians will be interacting with the young musicians at the Music Academy, most of whom are just setting out on their careers. More opportunities? With so many orchestras going bankrupt? Brooklyn Rider performs Wednesday, July 3, at 8 p.m. at Hahn Hall. Tickets are $50. For tickets and info, call 969-8787 or visit musicacademy.org. See brooklynrider.com.